Contractor Shaun Gober is always looking for new ideas to incorporate into his building projects. Those ideas come from a variety of sources. While on vacation, he read an article on the growing popularity of the Modern Farmhouse in an industry magazine. Characterized by a variety of textures, including wood and galvanized steel, along with comfort and practicality, the Modern Farmhouse style offers simplicity and convenience with a modern flair. Gober and his wife Crystal have always loved the classic Farmhouse style and found this updated twist intriguing. After completing some research that included combing through plans and pulling out the various parts and pieces they loved, they were ready to create their own unique masterpiece. From day one, Gober decided to give his team of skilled workers and trusted contractors an unprecedented level of creative freedom. Having worked together for years, he knew that by offering each one flexibility in creating a space, they would come up with something amazing. They didn’t disappoint him. Upon entering the home, you are greeted by a mosaic tile compass inset in the floor, the first of many thoughtful design elements. To the left is a charming dining area that includes a sliding barn door on the far wall. The door offers access to a walk-through pantry, where a strategically placed west-facing window provides the perfect spot for an indoor herb garden. The pantry is also accessible from the kitchen, which includes custom quartz countertops, an island crafted from two slabs of wood harvested from a Leelanau County walnut tree, and a range hood handmade from the wood of a 120-year-old barn in Glen Arbor. To finish it off, they used Classic Twenties Series tile from SomerTile for the backsplash, creating that distinct farmhouse appeal. Just beyond the kitchen, you cannot miss the 72-inch galvanized steel windmill fan adorning a cozy sitting area. The crew painted the fan with bronze paint and allowed the sun to create a true bronze patina finish. The same methods were used to patina the gooseneck lighting and other metal features around this area of the home, creating a distinctive look. A 48-inch Fuego Flame wood burning fireplace wrapped in Old Mill Thin Brick with built-in shelving on both sides create a comfortable atmosphere. A custom barnwood mantel supported by handmade cast iron brackets makes a bold statement. 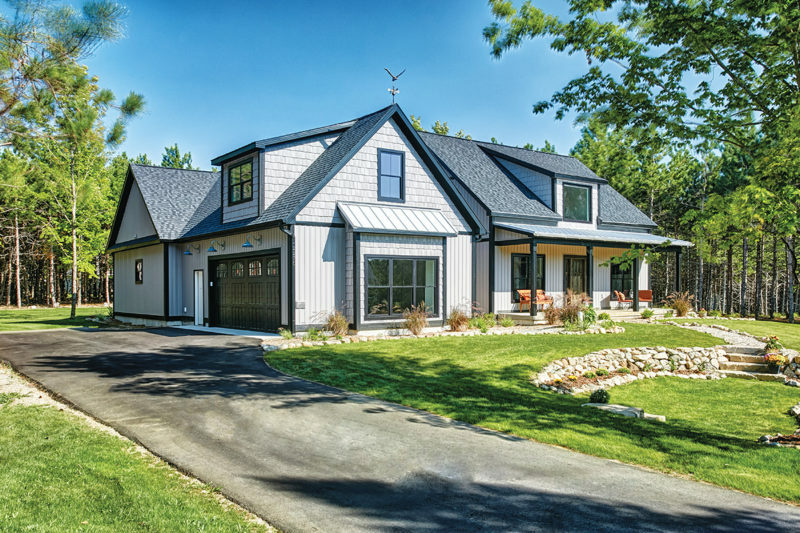 Representative of the Modern Farmhouse style, Gober chose products like 12-inch LP SmartSide siding, normally used outside, paired it with wainscoting on the walls, and added hand-crafted coffered ceilings. These features all work together to add dimension and texture to the bedrooms, bathrooms, and hallways. The master bed and bath are washed in natural sunlight with floor-to-ceiling glass through the use of classic transom windows. Features of the master bath include a freestanding tub with a fixture that is a work of art. A massive walk-in shower with rain showerhead and more Classic Twenties SomerTile on the floor and walls create a classic feel. Oh, and let’s not forget the 10×10-foot walk-in closet. A convenient bonus room above the garage offers space for visiting family and friends. With a wall of distressed turquoise blue wood paneling, this room is a throwback to days gone by and reminds me of the cabins we used to visit in the summer when I was a kid. The pinnacle of this home could very well be the basement. Gober was going for the feel of a true 1920s speakeasy pub, and he hit the nail on the head here! As you walk down the stairs, you see a wall of turquoise blue distressed shiplap with two matching glass windows that hold a secret – one of the windows is actually a secret door to a billiards room big enough to house a regulation-size pool table and a movie theater with a 12-foot screen. Gober was on a mission to prove that a comfortable, versatile room could be created with little to no added expense. A simple stage at the back of the room provides an area for kids to perform plays, put on a puppet show, or have some fun with karaoke. With the use of cozy bean bag chairs or other simple seating, the stage doubles as a raised seating area during family movie night. Just outside the secret rooms is the 15 ½-foot-long bar trimmed in traditional mahogany wood and a back wall lined in mirrors and glass shelves. A two-tap Kegerator fridge adds convenience to this inviting gathering space that is sure to be “the” place to hang out in the neighborhood. A spare bedroom and room for a poker table make the space even more versatile. We cannot forget to mention the basement bathroom, which is a sight to behold! A massaging jet steam shower encased with a custom-made barreled brick ceiling fits right in. When asked what his favorite feature of the home is, Gober was not able to pinpoint a specific room or feature. For him, it truly comes down to the entire finished project. It was a group effort, bringing in the creativity of so many people to offer a truly unique home – a home that will be cherished for years to come by its new family. The idea that so many people could have a hand in the construction of such an astounding home brings Gober great pride and joy. It’s obvious with the completion of this year-long project that his steadfastness has paid off. *A special thank you to Peggy Miller, owner of At Home Suttons Bay. Peggy was responsible for the staging of this amazing home.